Antiseptic, rejuvenating and relaxing. The sweet, musky aroma of Patchouli Essential Oil is quite unmistakable, with a sweet-herbaceous, aromatic heart note, and earthy, root-like undertones. As it matures over time, patchouli develops a fruity and wine-like aspect that is highly desirable for rounding off aromatherapy blends and as a fixative in natural perfumes. It makes a great natural deodorant and is an effective insect repellent. Patchouli Essential Oil excels in skin care where it soothes, rejuvenates, moisturises and tones a diverse range of skin conditions, including chapped and cracked skin, cellulite, dandruff, fungal infections, scars, thread veins and wrinkles. It is highly prized when caring for dry, itchy or mature skin because of its soothing and rejuvenating abilities, in combination with its antiseptic and antifungal protective properties. 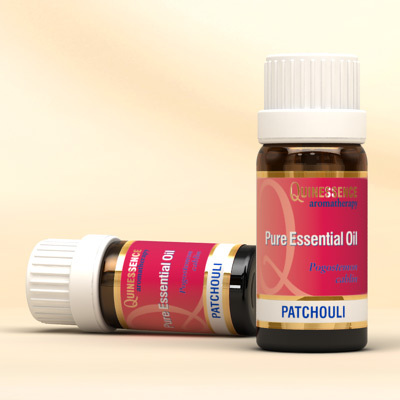 On the emotional system Patchouli Essential Oil fights stress and has a stabilizing, grounding effect on negative and depressive emotions such as anxiety, excessive mental activity, insecurity and general mood swings. As well as calming the mind it is also relaxing to the body, helping to combat the ravages of stress and encourage a good night’s sleep. It has long been known as an effective aphrodisiac.